What are the rights of photographers taking photographs of the inland waterways and what are your rights as a boat owner? I have been asked by various people taking photographs if I minded them taking photographs of our boat or even our dogs. Even the Gruffalo has been known to request being given time to brush her hair. Prior to consenting to be photographed on the boat. To be honest, most people, don't ask and just seem to take snaps and we try to act as nonchalant and normal as possible. This started me out thinking about what permissions might be needed if I was photographing or videoing parts of our publicly owned and charitably funded canal system. Does the fact that the public own the canals make any difference. CaRT it seems have conditions in place for anyone wanting to use the canals for photography or filming. CaRT's website says "For enquiries about filming or photography on a Canal and River Trust property, Please contact Claire Risino or Sarah Rudy." Whilst browsing on the CaRT website, I found a short note saying that "The Sheffield and Tinsley Canal achieved fame in 1997 by starring in the opening scenes of the comedy film The Full Monty." Most people can remember Gaz, (stuck with Dave on a car roof in the middle of the Tinsley canal) saying "Ey up, Dave someone's coming." Passer-By "All right?" Gaz "Aye, not so bad." Dave, [after the Passer-by leaves] "Not so bad, Not so bad? That's not much of a chuffing SOS is it?" That was pretty much the end of the canal in the film. Short, sweet and funny. However, The Sheffield and Tinsley Canal had already achieved great fame in the Television series "I didn't know you cared." When four complete series (which were broadcast between 1975 and 1979) frequently used the canal as a backdrop. There were even scenes filmed on a narrowboat in the Sheffield Canal basin. The Tinsley deep lock featured more than once. 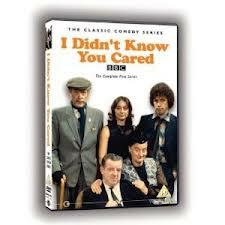 I Didn't Know You Cared was a BBC television comedy set in a working class household in South Yorkshire. Written by the late Peter Tinniswood. The main characters are Carter Brandon played by Stephen Rea, Uncle Mort played by the wonderful character actor Robin Bailey, his mother, Annie played by Liz Smith, his father, Les played by John Comer who went on to star in Last of the Summer Wine. Carter's girlfriend Pat Partington was played by the gorgeous Anita Carey and the local slapper Linda Preston was played by Deirdre Costello who also played the tart clippie in "On the Buses." Many of the scenes in the series feature the canal between Tinsley and the Sheffield canal basin. Some of the scenes were filmed only a stones throw away from our mooring. Needless to say I have the whole series on DVD.